A young man, Colin (Alastair Kirton), is infected in a sweeping zombie apocalypse and is damned to shamble ever rotting around the dreary streets of London where he's met with chaos, prior loved ones, and some living being just as deplorable as the undead. 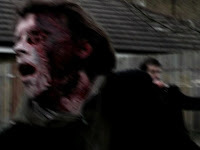 Marc Price's Colin is purported to have cost a staggering £45 ($65, for a crowbar and tapes) and is generally sold as being "the first zombie film from a zombie's perspective." I doubt the validity of the first claim and the second isn't true (Andrew Parkinson's mega-depressing I, Zombie: The Chronicles of Pain (1998)), but that doesn't diminish Price's achievement. This is one of the most impressive real no-budget wonders of the last decade, just not for the expected reasons. Given the lack of cash, Colin doesn't lean on the better odds of embarrassing itself with a cavalcade of DIY cheapjack zombie mayhem that we've all seen before. Instead, Price wisely focuses on the humanistic qualities of the titular character's reactions to the madness his kind has wrought against humanity. We see Colin search for fleshly sustenance, feel shades of his former self through objects and locations, and encounter an array of humans from hideous deviants to street marauders. Familiar zombie vs. human societal ideas also explored elsewhere in zombiedom are touched upon, but it's the wealth presented here and how they're weaved into the narrative's fabric that sets Colin apart. It's all very personal and that's genuine if this brand of apocalypse were to actually occur. The rest of the world wouldn't matter in the face of the world that you know completely collapsing whether you're alive or...undead. The character of Colin is ultimately a decomposing yet walking corpse much to the horror of his victims and sorrow of the humans that once called him family. One feels empathy towards Colin for a plight he didn't ask for with most of those around him terrified by his very presence. All too often low budget zombie flicks only flirt with these considerations, feel required to have forced badasses saving the day, and become transfixed with the glory of exploding squibs and blood-slinging hammers. The emotional basis Price builds Colin upon is what saves his debut feature from the scrapheap of living dead also rans. Price's direction and editing have an obvious Leone or Peckinpah grounding with long sequences of relative quietness punctuated by sudden moments of loud, chaotic tension. The filmmaker isn't given to crass bravado with his skill only working to mask the production's limitations. It would be wonderful to see what Price could do with more resources as his ability to hold attention with very little action for long periods is extremely impressive. Jack Elphick and Dan Weekes' score, which a film of a much higher budget would love to have, also has to be commended for greatly helping the impact of the visuals. If I had to quibble, the film feels a little long at 100 minutes with some scenes running a few steps more than they should, but this isn't new with films of this ilk and with so many positive attributes this indulgence is fine. Overall, Colin exhibits aspects that one would hope to see trickle up through the subgenre and you'd be well-served to check this one out. Kaleidoscope Home Entertainment's British 2-Disc Special Edition (Region 2/PAL) is a bit of a puzzle. With the inherently poor image quality of the 1.33:1 full frame transfer (no Blu-ray for this one), you'd expect the second disc of fifty-one minutes of supplements to fit onto just one disc. I haven't checked out the extras, but there's a Marc Price/cast commentary, a forty minute making-of, and eleven minutes of deleted scenes with Price commentary. Amazon.uk currently has the single disc and this double disc for the same price which converts into a tidy $14 shipped to the U.S., probably cheaper than a (still unannounced) stateside DVD release. Great review. I can't wait to see this. They need to announce a stateside release, ASAP.